Treats that motivate your cat, cut up in lots of little pieces (smaller than your cat's nose, approximately). Unless they're super in love with their kibble, use something more special because it'll motivate them better. Something to put the treats in while you work. This can be your pocket, a ziplock, or a treat pouch on your hip. (Keep in mind that squishy treats get gross in pockets, and that if your cat is super food motivated, setting a container of treats down nearby instead of keeping it on you is only going to distract from the training session). A harness and leash (It's suggested to get one specifically designed for cats, rather than a small dog harness). A space to work your cat feels comfortable in and can roam in freely. Patience. Getting a cat accustomed to wearing a harness can be a process that takes weeks or months, depending on your availability and your specific cat's needs. When it comes to training your cat to wear a harness and walk on a leash, using a clicker is optional. If your cat is already clicker trained, that's great! You can absolutely use that skill for this: when you see 'reward your cat' or 'give the cat a treat' in the text of this how-to, replace that with 'click and treat'. However, it's entirely possible to follow this article's steps without using a clicker or other bridge signal with your cat. 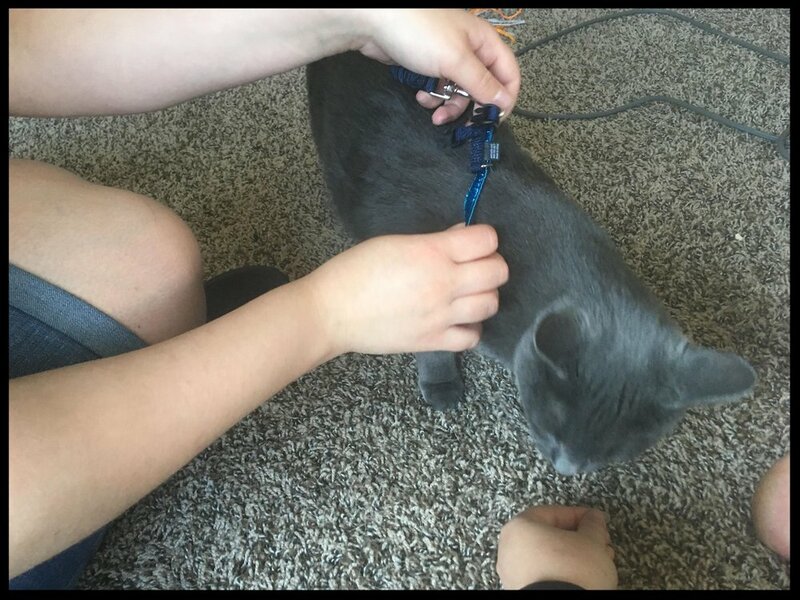 What this article teaches you to do is desensitize your cat to the harness and shape the way you want your cat to interact with the harness through luring and sequential approximations of the desired behaviors, and while a clicker can be useful if your animal already learns that way, it's definitely not necessary. The very first thing you want to do - long before you ever even think about putting anything on your cat - is to introduce your kitty to the harness and leash as harmless objects. Put them on the floor near your cat. If your cat is nervous about the harness being out (for instance, if they've been forced into a harness before and dislike them), just leave it out until the cat gets used to the idea that the harness being in the room =/= the harness touching the cat. This might mean leaving it ten feet away from your cat at first, and that's fine. Once your pet is comfortable with the harness being in the same room, move it a little closer, and wait until the cat is comfortable again. Continue working on this gradually (over days, not hours) until you can pick up the harness, move it around, and set it back down without your cat noticing. Under no circumstances should you have approached the cat with the harness, or put it on them during this stage. If your cat doesn't care about the harness existing (or you've worked with your nervous cat to where they're comfortable around it now), it's time to encourage your cat to interact with the harness. Does the cat stay relaxed when the harness is brought out? If yes, move to Step 2. If no, continue desensitization work. Step Two: Investigate the Harness / Harness Time Means Treat Time! Grab some of your cat's favorite treats and put the harness on the ground near your cat. If your cat goes to investigate it naturally, great! Toss them a treat as soon as they approach / sniff it. If your cat isn't super interested in it, encourage them to investigate it by putting treats on top of it. Once they approach, reward them with more treats. In both of the above cases, repetition is key. One your cat engages with the harness, move to somewhere else and repeat, or put it away for a while and bring it back out a couple hours later. If your cat has had previous bad experiences with harnesses, you might have to put treats just in proximity to start, and that's fine. Stay at a distance and toss the treats to your cat, allowing them to retreat if they feel they need to after they grab each one. The goal is for your cat to learn it's safe to approach the harness - they need to trust that you won't grab them and force them into it. Repeat this a couple of times a day for at least a few days. When your cat is literally shoving his face into the harness on the floor to look for treats, or running over to investigate it when you bring it out (because the harness showing up has consistently signaled the arrival of tasty food), you're good to move on to the next step. Does your cat associate the harness being brought out with positive things, and readily approach it or interact with it? If yes, move on to Step 3. If no, continue rewarding your cat for approaching / sniffing / touching the harness. The goal of this step is to teach your cat to put the neck part of the harness on themselves when you hold it up - this creates a much more positive association with wearing the harness than restraining your cat to put the harness on them does. It has to be done slowly and carefully, and your cat's comfort level must set the pace. To start, hold up the harness so that the neck hole is open, and approximately at head-height for your cat. (Make sure the straps of the harness are super loose for this part, so there's a nice big opening - fitting it appropriately will come later). At this point, your cat should be interested in investigating the harness when you bring it out, so continue to reward your cat with treats for sniffing it or touching it while you hold it in this new position. Once they've figured out that putting their head near the loop gets them treats, stop rewarding them for every sniff - wait until they put their head in the center of the loop, or start poking their nose through it. If your cat decides to start putting their head into the neck loop on the harness while you hold it up, great! If your cat doesn't start putting their head through on their own, you can absolutely use a treat to lure them. No matter which method you're using, don't expect your cat to go all the way into the harness the first time: hold it where they can reach it easily with only part of their head through to start, and slowly build up how far you're asking them to go. (If you've having trouble juggling both the harness and the lure, an extra pair of hands goes as long way for this step). This step, again, can take a lot of repetition. Once your cat is comfortable putting their head all the way through the loop, you want to start phasing out any food luring you're using. The end goal for this step is that your cat will stick their head all the way through the loop and wait there for you to provide the treat. (If your cat is having trouble with waiting patiently - removing their head and walking away - go back to using the lure, but wait a tiny bit longer each time before you give it to them to build up the duration of the behavior). Ideally, you want to be able to let go of the loop so it's resting on your cat's neck before rewarding them at the end of this step. Does your cat willingly stick their head through the harness and hang out there after you let go of it without seeming stressed? If yes, move on to Step 4. If no, continue rewarding your cat for putting their head even partway into the harness. Try upping the value of the treat you're using, or loosening the harness even more. At this point, you need to figure out if your cat will be amenable to letting youbuckle the belly strap of the harness or not. Some cats, once used to voluntarily putting their head into the neck loop of the harness, won't care if you close the buckle under their belly; some cats will find it disconcerting. If your cat isn't comfortable with you manipulating the harness around their sides or clipping it under their belly, you'll want to work on a desensitization process. Once the cat has the neck loop on and you've let go of it, continue to feed them high-value rewards while you gently touch/manipulate the sides of the harness. Once they're comfortable with that, progress to picking them up slightly and moving them around against or under the cat very slowly. Use frequently, almost constant rewards for this part of the training. Work in slow approximations until you can reach all the way under the cat and connect the two pieces of the belly strap. (Towards the end of this step, a helper is often useful - they feed while you buckle the harness.) If at any point your cat is uncomfortable and backs out of the harness or otherwise attempts to leave, take a couple steps back in your approximations and work very slowly until the cat is comfortable again. If your cat is comfortable letting you connect the rest of the harness from the get-go, great! Make sure to reward them after you do so. Does your cat willingly let you buckle the belly strap of the harness? If yes, move on to Step 5. If no, work on rewarding the cat for letting you manipulate the straps around their body, then work up to fully closing the harness later on. Once you can get the harness actually on your cat fully, don't worry about adjusting the straps just yet. It's more important your cat get used to the feeling of wearing it before you tighten it. At this point, your cat should be willing to hang out in the harness once it's buckled without freaking out or trying to get out of it. So now, make the time your cat wears the harness awesome time. Put the harness on your cat for a short period of time each day. While they're wearing it, take that time to really focus on your cat. Snuggle with them and pet them, or throw a few treats around for them to find, or pull out a new toy. Find things for your cat to do that are both exciting (so that wearing the harness is always fun) and also encourage your cat to move, so they get used to the feeling of it moving against their body. Once your cat is comfortable in the harness, you can adjust it to actually fit their body. Some cats will let you do this without caring at all, but some may need to be rewarded with food for standing still and letting you mess with the harness. If the latter is the case, utilize a helper to feed the cat while you adjust - it's much easier. Next, bring out the leash. Some cats may be fine with it from the beginning, but others may be more skittish. If the cat is skittish, use the process from steps one and two of this article to establish the leash as a positive thing for your cat to interact with and touch. Work your way up to attaching the leash to the harness, and letting your cat drag it around after them while wearing the harness indoors. No More Steps! You've Done It! At this point, your cat is officially harness trained! When you're certain your cat's harness is fitted tightly and your cat is comfortable with having a leash attached, you can pick up the leash and being to let your cat explore the outdoors!